Validic is the industry-leading digital health platform and our Validic Connect API allows nearly anyone generating health and wellness data to seamlessly share it with organizations seeking to consume it. Typical Validic customers are healthcare organizations, wellness companies, and fitness-related organizations. 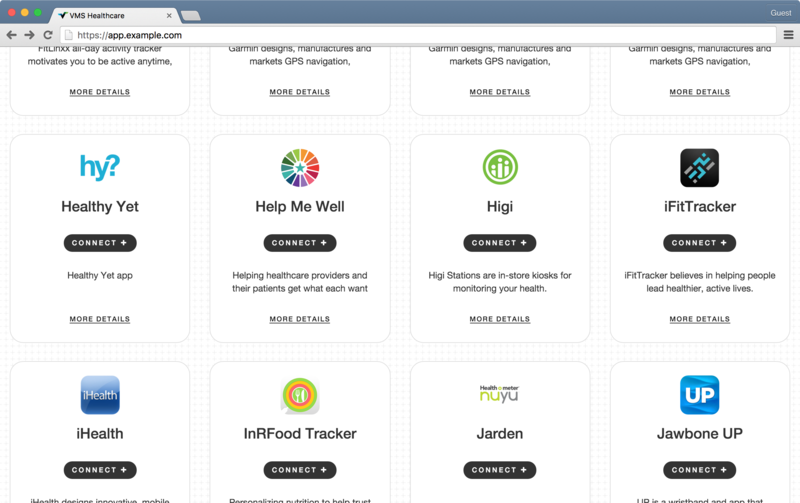 We're looking for partners who are developing medical, wellness, fitness applications and devices that provide reliable, actionable data, but don't want to develop or maintain an API. Just push your data to us and we'll take care of the rest. Last but not least, we have customers that want your data! After integrating with Validic Connect, your application will be visible to millions of users in the Validic Marketplace. As a Validic Connect partner, we'll make it easy for you to find organizations who want your users' data and make it easy for them to consume it. Partner: An organization pushing data through the Validic Connect API for our customers to consume. Consumer: An enterprise customer of Validic. 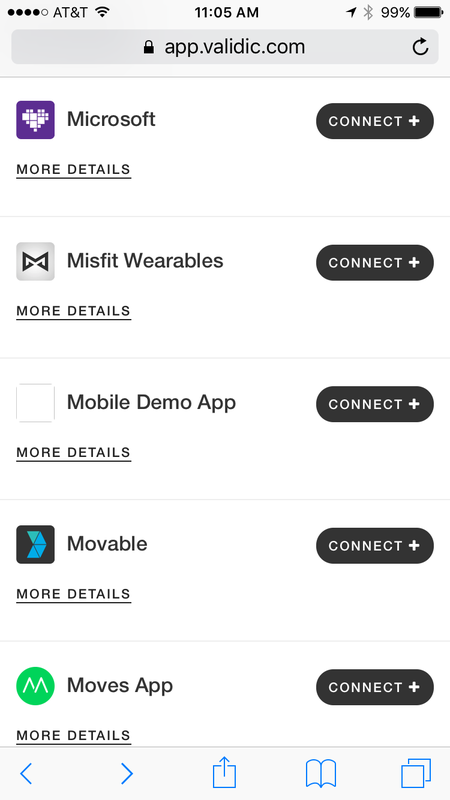 These organizations have integrated with our Enterprise API and want to pull data coming from your devices and apps. User: An end-user shared by you and a consumer. Sometimes referred to as the “third-party user”, these are the people using your device or app to generate data they want to share with consumers. Application: Your integration with Validic. Whether you are integrating a device, web app, or mobile app, the term application refers to your overall connection to Validic. Web Authorization: The typical authorization flow where user can authorize via an online Parter web app. Mobile Authorization: The less common authorization flow for apps who have no way to authenticate a user over the web. Typical for mobile apps that have no server-side or no online user portal. Marketplace: A custom catalog of applications available for users to connect with their account. This is where users will see your application and connect it to their consumer organization account. Authorization URL: For web authorizations only. The URL you want us to direct users to for authorization when they click "Connect" in their Marketplace. Signature: For web authorizations only. A url parameter sent from Validic encoded on the Authorization URL. You will use this to validate a successful authorization request. PIN: For mobile authorizations only, the 7 digit number the user will be given to authenticate on your mobile app. UID: The unique identifier you assign to a user in your system. You will return this along with the signature after a successful authorization. Activity_id: The unique identifier you assign to a record in your system. Notification URL: The URL you create to receive notifications from Validic about the status of connections to your application. Integrating with Validic Connect involves two main workflows: first, supporting authorization requests to your app and, secondly, pushing user data to Validic Connect. As part of the authorization process we can accommodate traditional web apps as well as mobile-only applications without server-side login. Following the authorization process, your app will make CRUD requests to Validic Connect to push that user's records in the form of Validic's Standard Objects. After authorization, the user is redirected to their Marketplace and your application is shown as "Connected"
Mobile authorization is also a familiar process that uses PIN-based confirmation. A user navigates to their Marketplace with the option to connect them to their application. 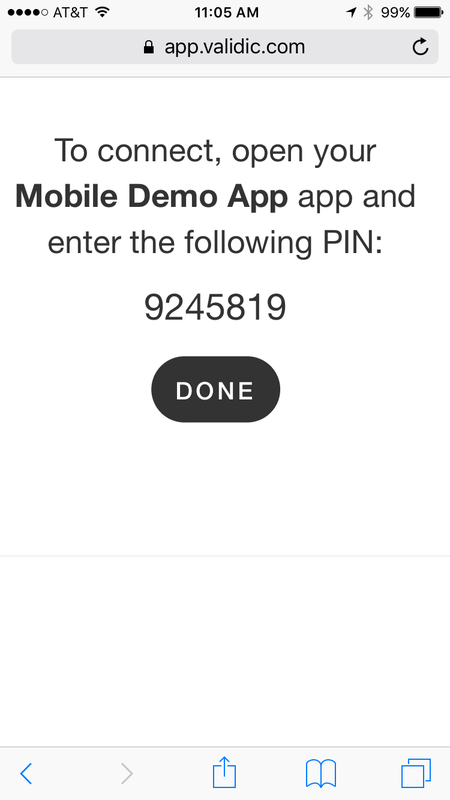 The user is given a PIN code and told to input that PIN within the mobile app. The user navigates to the Pin Page in your app and enters the PIN. A successful authorization results in being shown as "Connected" in the Marketplace. Following the authorization process, you will begin pushing that user's data through Validic. Once created in Validic, these records will be available to the consumer organization. Using these credentials, you can begin integrating with the Validic Connect API. When you've completed your application, tested the auth process and data transfer, and decide it's ready for release, you will submit your App for review. We'll need to gather some additional information about your application, go through an internal testing process, and work with you to find some beta customers to test your integration with real-world data. Once approved, your app will be available to our customers as an official part of the Validic Marketplace. There are several required aspects of for any application to integrate with Validic Connect. This section outlines the specific steps you need to take be able to provision users, which in turn will enable you to begin pushing data. As you start to work on your application you may find it helpful to review the Validic Enterprise API docs to get a better idea of how organizations will be consuming the data you push to Validic Connect. Validic Connects supports integration of both web and mobile apps. The authorization process for each type of app is slightly different, but both will be familiar to users. The outcome of both processes is a Validic user being provisioned to receive incoming data. You only need to worry about setting up one or the other unless you're developing both a web based application and mobile application. 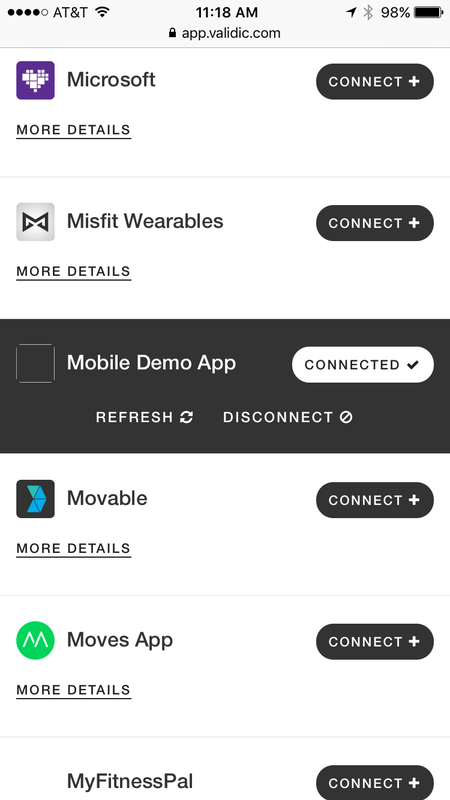 Many of our Connect Partners feature both mobile apps and web apps as part of their product. When determining the authorization method you should use for your application, keep in mind that the mobile app authorization process is specifically for mobile apps that do not have a server-side component. If your mobile app sends data to a central server that in turn sends data to us, you should use the web-based application authorization process. If you will be sending requests to Validic Connect directly from your mobile app, you'll need to use the mobile PIN-based authorization process. Determining a proper UID is crucial for authorization as well as ensuring proper transfer of data to Validic Connect. Your user’s UID should be a random string of letters and/or numbers, unique to each user in your system, and cannot be any kind of Personally Identifiable Information (PII) such as an email address, name, or social security number. Attempting to use PII as a UID may delay your integration with Validic Connect. If you do not already have an acceptable unique identifier for each of your users, you must generate one for them. This can be done on the fly or in bulk depending on your preferences; however, it must be done before confirming authorization. If you choose to generate a UID on the fly, you must persist that UID as part of that user’s record in your system and validate uniqueness upon generation. You should always send the same UID for a particular user to confirm authorization. For example, if a user reconnects after a disconnect or authorizes several consumer organizations you should send the same UID with each authorization confirmation. The authorization process verifies that a user intending to share their data from your application is in fact the owner of that data. Similar to a standard OAuth implementation, you’ll need to create an authorization page where users can verify their identity and subsequently authorize their data to be shared. 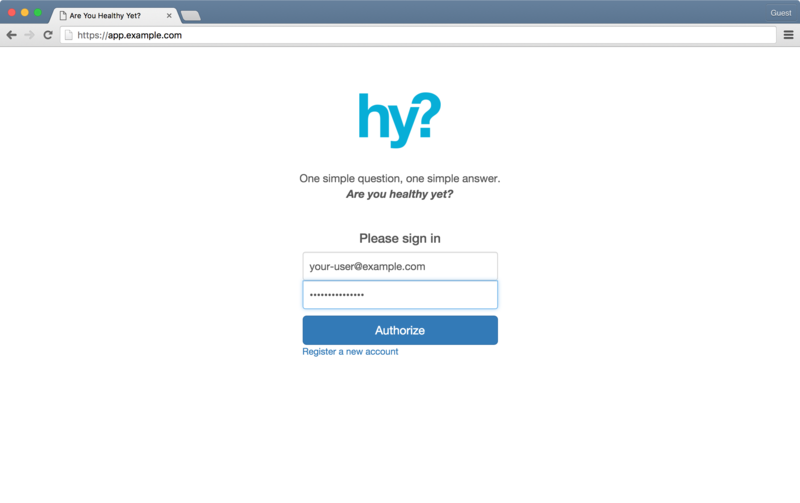 This page will be different than your standard login page and should be accessible via your Authorization URL. Once the user is successfully authenticated and has authorized you to share their data, you’ll need to send us a UID to associate your user with a user in Validic Connect. signature -- A unique identifier for the auth session. consumer_name -- URL encoded name of the consumer organization. You will need to temporarily retain the signature, consumer_name, and redirect_uri. uid -- The users UID in your system. signature -- The signature parameter from the request to your Authentication URL. _id -- Validic's unique identifier for the user. You must associate this with your user to push data to Validic Connect. uid -- The UID you provided to us. This confirms we have authorized the correct user. authentication_token -- The user's Validic authentication token. Retain this as part of your user's records, too. consumer_name -- The name of the consumer organization the user authorized. Store this if you want to display a list of applications the user is sharing data with. redirect_uri -- you redirect the user here for the authorization step of the process. Once you've saved the _id and authentication_token you will redirect the user to the redirect_uri. If you receive a response containing an error you should still redirect the user to the redirect_uri and check our API Responses guide for more information about that error. access_token -- The user's Validic access token. Retain this as part of your user's records, too. application -- The name of the consumer organization the user authorized. Store this if you want to display a list of applications the user is sharing data with -- just make sure the rest of the authorization process is successful before doing so. Once the user has successfully authorized sharing of their data, it is a best practice to send historical data for that user and begin submitting user data as it is created or updated. "message": "expired pin or bad request token"
type -- Lets you know the notification is an disconnect. message -- Provides some context for the notification. third_party -- The name of the consumer organization the user stopped sharing data with. connected_third_parties is an array of all consumer organizations with current authorization. If the user shares data with more than one consumer organization you will see the remaining organizations in the array. Otherwise, you will see an empty array. _id -- Validic's unique identifier for the user. uid -- The UID you provided to us. If the connected_third_parties array is empty, you must stop sending data to Validic for that user. Once you've set up your auth process and provisioned some test users, you are ready to push some data. Pushing data to Connect is as easy as sending a POST with the user's data. Validic supports 8 standard objects or data types. It's normal that some of your data may not fall cleanly into the Validic standard object schema. If that is the case, you should make your best guess for how the mappings should work and send that mapping to Validic for review. source & source_name -- the source of the data. These are set by us when setting up your application. The Validic _id in the response for this activity should then be saved as part of the record in your database to allow you to update or delete this record in the future. If you receive a response where some records were not created successfully, you should correct the errors and send another POST with those records. This is particularly relevant for Routine data which represents data aggregated over the course of the day (for example “steps”) instead of single data point on that day. If you are pushing Routine data such as steps, you should POST a single record representing that day’s running total and subsequently send PUT requests to update that single record. If you need to delete a record in Validic send a DELETE request using the existing record’s Validic _id. We'll identify the record by the VALIDIC_RECORD_ID, so all you need to include in the body is your access token. you receive a standard 200 OK response if the record was successfully deleted. Understanding the way Validic handles timestamps and timezones is critical before you begin pushing user data. The record's timestamp represents when an activity was recorded and must be in ISO 8601 format in UTC time. Separate from the timestamp, the offset is stored in its own utc_offset field. In order to ease compliance with this standard, the Connect API will also accept POSTed records that only supply a valid ISO 8601 timestamp. In the case where the timestamp is supplied and the utc_offset is not, the timestamp's offset will be used to populate the utc_offset and the timestamp will then be converted to UTC. Note: this does not apply to updated records through PUTs. As you can see, the offset is applied to the timestamp by adding or subtracting the offset from the midnight local time timestamp. The activity_id you send with each record must be a unique identifier for this record in your system, analogous to the uid you submitted earlier. Routine records are a special case because they represent data that is aggregated and updated throughout the day. For example, a running total of steps taken during a day. If you wish to push routine data, you should POST a new record for the initial reading and update the same routine record using a PUT for changes throughout the day. Because a single routine record in Validic often represents an aggregate of several records in your system, we suggest that the activity_id you select for routine records reflect the date in some way. Outside of our standard attributes, Validic is capable of accepting new fields you define as part of your POST. You can add these custom fields as part of the extras field. Consumer organizations can choose to view this data by using an expanded flag in their request for data. They'll be provided with integration notes on any extras you may provide. It is important to mark users in your system as connected to Validic for as long as they have at least one authorized consumer organization. Your user records should include some kind of connected_to_validic flag that is set to true once the authorization is confirmed with Validic and false once you receive that user’s last disconnect notification. This is evident in the connected_third_parties array present on both sync and disconnect notifications. If a user disconnects from all organizations, you must stop sending data for that user. A best practice for handling historical data (typically covering the last 6 months) is to POST to Validic upon receiving a user’s first Sync Notification. If a user authorizes access to their data by an additional consumer organization, you do not need to send historical data again. Subsequent authorizations will also receive that user's historic data. In the case that a user disconnects from all organizations and you stop sending data for a period of time, then the user reconnects you should send historical data that covers the period of time that user was disconnected. By default, bulk data calls are ordered by the timestamp of an individual activity. The challenge here is that if an individual was on vacation for a week and syncs a device upon returning, how will you know of data that occurred a week ago but only just made it into the Validic system? The latest endpoint gives you the latest data recorded and updated in Validic, regardless of when the activity occurred based on the last_updated field. For example, if you pulled and processed Validic data at 4:00 a.m., and then you want to update your system again at 8:00 a.m., you can specify to only receive new and updated data that was added to our system between 4 a.m. and 8 a.m. by appending a timestamp with the start_date and end_date. You should look for discrepancies using each activity’s Validic _id stored from the initial POST request to Validic. You should reconcile any incorrect data with a PUT and reconcile any missing or duplicate data in Validic using a POST or DELETE. A regular reconciliation comparing what is in Validic with what is in your database will ensure consumers and users see the same data from Validic as they do in your application. Each Standard Object record being sent to Validic Connect has specific requirements. You will need to properly map your data objects to the Validic Standard Objects to be able to push data through Validic Connect. The Core API Documentation provides some additional information you may find helpful when mapping your data to the Validic Standard Objects. Of particular interest might be this explanation of differentiating Fitness and Routine objects. If you need assistance with mapping your data attributes to Validic’s please email us at partner-support@validic.com. We provide support to help make sure your data is mapped appropriately and we communicate the mapping structure to consumer organizations. If you are having trouble finding a standard endpoint or attribute that makes sense to map to, you can always choose to add custom attributes as “extras” to any of our standard objects. Any request with an invalid Organization access token or User authentication token (for mobile applications) will receive a 401 Unauthorized Response. When integrating with Validic, we ask that you continually test your integration, including both the authentication process and the flow of new data. Below we walk through how to test the Authentication and Authorization process as well as the correct flow of data from your system to Validic. Validic provides a suite of testing tools that makes it easy to ensure your integration is working correctly. To access the tools sign in to your account and navigate to the "developer tools" link in the header. Before building your integration you should be able to manually test the authentication and authorization process. 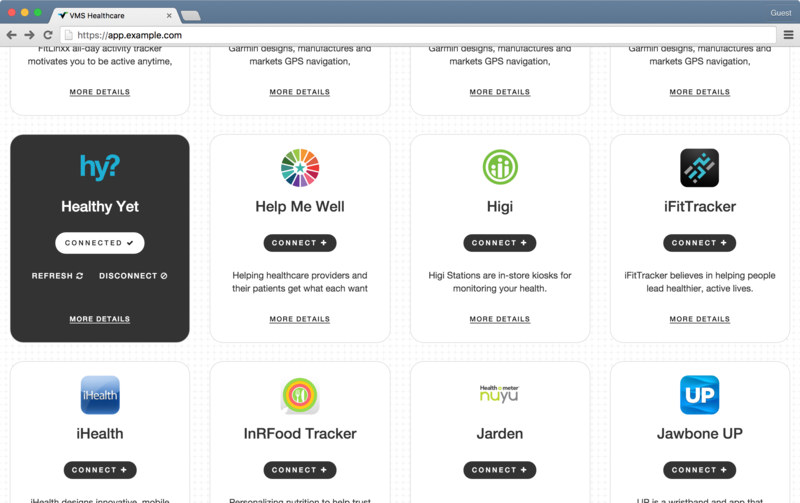 Navigate to your dashboard in the Partner Hub and click on the "Test Your Integration" button at the top of the page. You should see your test app in a new window. Click the “Connect” button. Validic should redirect you to your Authentication URL (you can enter your Authorization URL in the "My App" section of the Partner Hub). Once redirected to your Authentication URL you should see both the signature and sync_url passed in the url as parameters. At this point your application should allow the user to login to your system and then, upon successful login, authenticate with Validic using the uid and signature. However, to test manually you should simply be able to send a cURL request to the sync url and supply a dummy uid and the signature (see Authenticating Users Who Want to Share Data above for the specific POST). This request should return a 201 that includes user credentials, the application, and the redirect_uri. You should then manually navigate to this redirect_uri which is a Validic hosted page where you confirm authorization. Once there, click “Authorize” and you should then be returned to the original Validic Marketplace with your application now highlighted as being connected. You can finally check if a Sync Notification was sent to your Sync Notification url (see Receiving Sync Notifications above). These steps are also shown through screenshots in the “How it Works” section above. As you build out your application to handle the authentication programmatically, you should continue to walk through this same user experience to ensure everything is working properly. Once you receive a Sync Notification you can manually test pushing data to Validic. Using your organization access_token, organization_id, and the user_id returned in the Sync Notification, you should be able to manually POST a record to Validic. See Submitting User Data above for an example of how to push a single Routine record to Validic. Assuming your POST was formatted correctly and with the correct credentials, you should see a 201 response with the newly created record in Validic. For a full list of GET requests by object type see the Objects section of our Documentation. Manually pushing data to Validic and checking to ensure it correctly shows up will make testing your application’s behavior much easier to understand. As you begin to incorporate this functionality into your application, you should be continually testing by recording sample data in your application and check if it shows up on the test user’s activity data.